Each page has a top copy and 2 carbon copies, the top copy can be removed and handed in to your workshop manager or office to report a defect, the second copy remains in the book and is a copy you can produce on the road if you are stopped by for example the D,V,S,A or Police, the third copy is for the garage to complete to state when any defect was fixed. What happens if you find a defect and Don’t report it? If you are stopped in your vehicle by the D,V,S,A they will carry out an inspection of your vehicle if a fault is found they can issue a Roadworthiness prohibition (PG9). This is given for mechanical problems or for the condition of a vehicle’s bodywork and equipment, this could have an immediate or a delayed effect depending just how severe the defect is. DVSA has published a list of defects explaining whether immediate or delayed prohibitions are issued. This is given when a vehicle examiner believes that a severe defect is due to significant breakdown in the vehicle’s maintenance procedures. a problem that could have occurred during the journey. a problem you couldn’t reasonably have been expected to have noticed (eg an underside defect). You could get an ‘S’ marked prohibition if the examiner believes there’s been a significant breakdown in the maintenance procedures agreed as part of the operator’s licence. The prohibition can start immediately and you or the operator could be prosecuted. DVSA will follow up with an assessment of the operator’s maintenance procedures. You could get this if an immediate problem with your vehicle has been temporarily or permanently fixed at the roadside but others remain. It means you can return to your operating centre or garage to permanently repair the initial problem and other faults. As determined above a 15 minute vehicle inspection before setting out on a journey can not only keep you safe by pinpointing a problem before it is too late, but also by filling out your HGV Defect books you will also save yourself a whole lot of problems that may occur by driving a vehicle on the road with a defect. Not only would you be safer on the road but also by completing your vehicle check sheet also protecting your license, if you did not report a defect and it was determined the defect was present before you set out on the road you could lose your license, your job or worse! 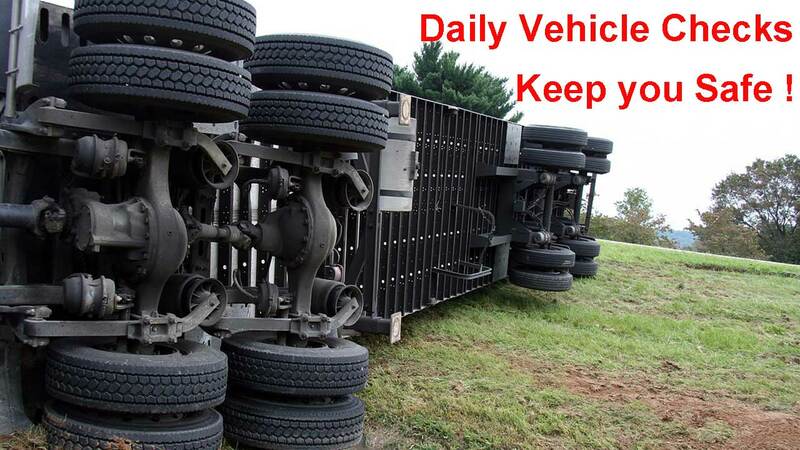 Thank you for reading this Article “HGV Defect Books vehicle check sheet UK” if you would like to leave a comment of your views please do so below.